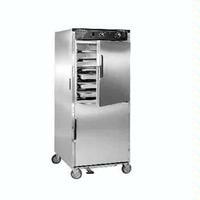 Fully insulated hot cabinet keeps prepared foods at serving temperatures. Powerful, yet efficient, heating system maintains the right combination of heat and humidity to properly hold products. 2000 Watts of heat holds food at up to 200°F (93°C). AquaTemp system allows you to hold with humidity by adjusting individual thermostats regulate humidity levels by controlling air temperature to 180°F (82°C) lowering air temperature allows for humidity up to 95%. Internal frame in body and doors plus reinforced internal base maintains structural rigidity. 304 stainless steel construction throughout for ease of cleaning. Smooth interior coved corners prevent food particles/grease buildup. Safety-conscious anti-microbial latches protect against spreading germs. High temperature ceramic magnetic latches for "easy open” twist-lock catch keeps door securely closed. Recessed push/pull handles on both sides prevents damage to walls allows easy maneuvering. Twelve sets of stainless steel wire universal angles accommodate a large variety of pan sizes on adjustable 1-1/2" centers. Integral drip trough on front keeps traffic area dry, safer. Provides mobility when fully loaded. view 2 year parts warranty.